Concrete Hardness / Test Hammers are used to determine the surface hardness of concrete and are one of the most widely used instruments in the field of non destructive testing (NDT) of concrete compressive strength. It is the quickest, simplest and least expensive method to obtain an estimate of the quality and strength of the concrete. The Elcometer 181 Mechanical Concrete Test Hammer provides a quick, simple and inexpensive method for non-destructive evaluation of concrete and other masonry materials. 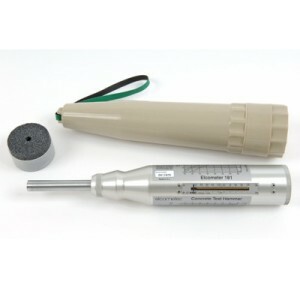 Concrete Hardness / Test Hammers are one of the most widely used instruments in the field of non-destructive testing and Elcometer can offer you mechanical or digital models. The HT 225A Concrete Test Hammer is designed specifically for the non-destructive testing of concrete structures. This method has considerable advantages over conventional methods of assessing the compressive strength of concrete in that large areas can be tested in a very short time at a very low cost. In addition it is possible to determine the variation in concrete quality between different sections of a structure with case. The HT 225A is comparable with the Schmidt Hammer, Type N, this method of testing is covered by DIN 1048 and BS1881 part 202. These standards refer to assessment of the rebound hardness of motar which is directly related to the compressive strengths of the material being tested. The charts on the body of the Elcometer 181 correspond to the test hammer angle, average error, conversion scales, MPa and p.s.i.